"When God hands you a gift, he also hands you a whip." 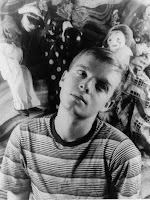 Truman Capote, who said the above in Music for Chameleons (1980), would have turned 83 today. He died in 1984. In Cold Blood, his pioneering nonfiction novel of 1965, has gone through more than 50 editions and generated four screen adaptations—two on the book itself (1967, 1996), two on its process (2005, 2006). It is often forgotten that Capote's close friend Harper Lee accompanied him to Kansas and assisted in the research of In Cold Blood; the book is dedicated to her. Capote also scripted the Humphrey Bogart-John Huston film Beat the Devil (1953) and admitted to making a mistake in resolving the notorious ambiguity in his screen adaptation of Henry James's "The Turn of the Screw," The Innocents (1961). My favorite of Capote's works is The Muses Are Heard, an acutely observed account of a Porgy and Bess troupe touring Russia in 1955. I was also struck by "Willa, Truman, Truman, Willa," a wonderful, woefully brief piece that appeared in the November 2006 issue of Vanity Fair, in which Capote describes a meeting with Willa Cather, one of his favorite authors. Happy 80th birthday, Barbara Mertz. MWA Grand Master Barbara Mertz, aka Barbara Michaels and Elizabeth Peters, turns 80 today. She published her first novel, The Master of Blacktower, in 1966, and it should be noted that long before the recent flurry of vampire novels, the Michaels novel The Dark on the Other Side (1970) dealt with an emotional vampire and can be read as a horror work (one friend told me that she had to turn on all the lights in her house after she read it—the greatest compliment to an author). Mertz's nonfiction Egyptology books Red Land, Black Land and Temples, Tombs, and Hieroglyphs are mainstays of undergraduate Egyptology courses—indeed, a revised edition of Temples will be issued by Morrow in December. She endowed a scholarship for mystery writing at Hood College in Maryland. Go here to see a Webcast of a 2003 Mertz talk at the Library of Congress. The last word belongs to Robert Barnard at the first Malice Domestic in 1989: "What can you say about Elizabeth Peters that she hasn't already said?" 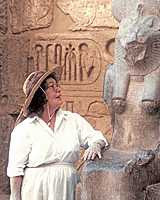 MWA Grand Master Marcia Muller, the creator of groundbreaking PI Sharon McCone, turns 63 today. It's hard to believe that McCone, the first modern female PI in a novel (Maxine O'Callaghan's Delilah West precedes her in a 1974 AHMM short story), celebrates her 30th anniversary in print this year; her debut, Edwin of the Iron Shoes, was published in 1977. It's even harder to believe that a writing instructor told Muller, according to her Web site, that "she would never be a writer because she had nothing to say." McCone's latest outing is The Ever-Running Man. Go here to see a Webcast of Muller's 2005 appearance at the National Book Festival. Revered historical novelist Roberta Gellis, who also has written mysteries and science fiction and fantasy works, turns 80 today. Her mystery series (including A Mortal Bane, A Personal Devil, and Bone of Contention) features Magdalene la Batarde, an enterprising madam in medieval England. The latest in the series is Chains of Folly (Five Star, 2006). 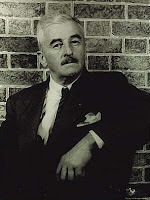 Today's birthday of William Faulkner (b. 1897, d. 1962) serves as a reminder that Faulkner was an avid mystery reader (according to A Companion to William Faulkner by Richard C. Moreland , Faulkner's library included works by John Dickson Carr, Dashiell Hammett, Dorothy L. Sayers, and Rex Stout). He also wrote some of his own, including Intruder in the Dust (1948) and six stories with lawyer Gavin Stevens that appear in Knight's Gambit (1949). The Providence Sunday Journal savaged Knight's Gambit with "[t]he result is Faulkner disemboweled and thunder without God" (reproduced in William Faulkner: The Contemporary Reviews 289). Wow. And I thought I'd read some bad reviews. Go here to see some vintage covers of Knight's Gambit and magazines with Faulkner's mystery work. Francis Scott Key Fitzgerald was born today in St. Paul in 1896. He died in 1940 and is buried in Rockville, Maryland (Fitzgerald's father, a Confederate sympathizer, was originally from Maryland). Go here to see his grave (his wife, Zelda, and daughter, former Washington Post reporter Scottie Fitzgerald Lanahan Smith, are also buried here). Fitzgerald's The Great Gatsby was influenced by New Jersey's Hall-Mills case (involving a Johnson & Johnson heiress; see Henry C. Phelps, "Literary History/Unsolved Mystery: The Great Gatsby and the Hall-Mills Murder Case," ANQ 14.3 : 33-39). I wrote an article for Mystery Scene in 1999 on some youthful attempts by Fitzgerald to write mysteries, most of them unsuccessful ("F. Scott Fitzgerald: Mystery Writer?" MS #65). There is a promising ghost story, "The Room with Green Blinds" (1911), in which a young man inherits his grandfather's house and a mystery with it. The story can be found in The Apprentice Fiction of F. Scott Fitzgerald (ed. John Kuehl, Rutgers UP, 1965). For an interesting article by Charles Scribner III on the original cover art for The Great Gatsby, go here. Little irritates me more than reading a review in which a mystery is described as "transcending the genre," as if we genre fans will one day have a "road to Damascus" moment, see the error of our ways, and, yea, verily, trod the righteous paths of "real" fiction thereafter. Thus I tend to collect those accounts that show that being in the genre is not such a bad thing and illustrate what mysteries can mean to their readers. You may have seen my earlier post on mystery reading of WWII POWs. There's the woman I helped in the library recently who needed some suggestions for audiobooks: she cared for a bedridden elderly lady, whose greatest pleasure was listening to legal mysteries. There's the famous story of the nurse reading Agatha Christie's The Pale Horse, who realized that her critically ill patient bore the signs of thallium poisoning, which had been misdiagnosed as a case of encephalitis. Christie wrote about the poison's effects in the novel. Most of all, there's this anecdote from Miracles on the Water (2006), by ABC News producer Tom Nagorski. It's about the SS City of Benares, which was carrying evacuee children from Britain in 1940 when it was torpedoed by a U-boat. One lifeboat was missed in the search for survivors, and its occupants (including Nagorski's great-uncle) endured a harrowing week alone on the stormy ocean with strictly rationed food and water, and people dying one by one. Children were in this lifeboat (many of the children from the City of Benares showed more courage than the average adult), and their chaperone came up with the idea of inventing a suspense serial and telling a chapter each night, as a way of keeping the children, as well as the adults, occupied. The star of this daily ritual? Sapper's heroic captain, Bulldog Drummond, pitted against nefarious Nazi agents. It's quite clear from the account that the serial helped to keep the passengers' spirits up, preserve their sanity, and convey the message that as Drummond always triumphs, they would triumph too. Not bad for a genre story. Happy birthday, Herbert George Wells. 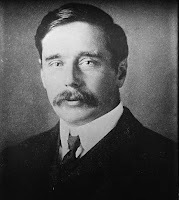 Science fiction pioneer and visionary H. G. Wells, author of The Time Machine (1895), The Island of Dr. Moreau (1896), The Invisible Man (1897), The War of the Worlds (1898), and numerous other works, was born today in 1866. He died in 1946. One of my favorite films is Time After Time (1979), written and directed by Nicholas Meyer, that pits Wells (played by Malcolm McDowell) against Jack the Ripper (played by a very scary David Warner). And here is an interesting 1940 radio encounter between Wells and Welles—Orson, that is—the creator of so much panic with the Mercury Theatre broadcast of War of the Worlds in 1938. Muckraking journalist and political activist Upton Sinclair, best known for his landmark 1906 work The Jungle that reformed the Chicago meat-packing industry, was born today in Baltimore in 1878. He won the Pulitzer Prize for Dragon's Teeth (1942), a novel that examined the rise of the Nazis. Other notable works among his 90 books include King Coal (1917; dealing with Colorado coal mines), Oil! (1927; about the California oil industry, which has been adapted into the upcoming film There Will Be Blood), and Boston: A Documentary Novel of the Sacco-Vanzetti Case (1928). He also ran as a Democratic candidate for governor of California in 1934. The Jungle has often been credited with the passage of the Pure Food and Drug Act of 1906, long advocated by Theodore Roosevelt. Sinclair died in November 1968 in Bound Brook, New Jersey, a town located next to my hometown of Martinsville. Mysteries Behind Bars (or Barbed Wire). Today's Washington Post ran an op-ed by Woodrow Wilson Center scholar Haleh Esfandiari, who was just recently released from an Iranian prison. In it, she mentions that "Georges Simenon's police thrillers ... made excellent prison reading." It reminded me that mysteries often have a more far-reaching impact than their writers think. A fascinating article is "'The Greatest Morale Factor Next to the Red Army': Books and Libraries in American and British Prisoners of War Camps in Germany in World War II," by David Shavit (Libraries & Culture 34.2 ). He mentions that the library at Stalag Luft III (aka the setting for "The Great Escape") included "342 detective novels" (about 18 percent of the entire camp library), one POW noting that "we could not have lived without books." The Oflag 64 Item (oflags were camps that held officer POWs) reported that the most popular detectives among these servicemen were Perry Mason, Philo Vance, and Ellery Queen. More recently, it was reported that the most popular authors at Gitmo included J. K. Rowling and Agatha Christie. ... who was born today in 1914. His legendary Make Way for Ducklings was awarded the Caldecott Medal in 1942. He died in 2003. To see the Boston Public Garden sculpture by Nancy Schon inspired by McCloskey's book, go here. ... Agatha Christie, who was born today in 1890. She died in 1976. The summer 07 issue of CLUES has an article by Marty S. Knepper positing the real location of Miss Marple's St. Mary Mead. ... and humorist extraordinaire Robert Benchley (member of the famed Algonquin Round Table, author, actor, and grandfather of Jaws creator Peter), who was born today in 1889. He died in 1945. Happy birthday, J. B. Priestley. British author, broadcaster, and prolific man of letters J. B. Priestley, who wrote the play An Inspector Calls (1945), was born today in Yorkshire in 1894. He died in 1984. 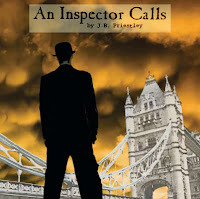 An Inspector Calls involves the prosperous Birling family in pre-World War I England and what happens when an Inspector Goole arrives on their doorstep with news of a suicide. Priestley also wrote Mystery of Greenfingers: A Comedy of Detection (1937) and Bright Shadow: A Play of Detection in Three Acts (1950). Other mystery-related works include Benighted (aka The Old Dark House, 1927); the spy spoof I'll Tell You Everything (1932; cowritten with Gerald Bullett); Blackout in Gretley (1942), a novel of Nazi espionage in England; and Salt Is Leaving (1966). The UK's Most Borrowed Books. For the most borrowed classic authors, the ones still going strong include Georgette Heyer, Daphne du Maurier (Rebecca, Jamaica Inn, The House on the Strand), and Agatha Christie (The Hollow, Taken at the Flood). Master of the twist ending William Sydney Porter, aka O Henry, was born today in Greensboro, North Carolina, in 1862. He began his writing life as a journalist for the Detroit Free Press and the Houston Daily Post (he lived in Austin for a time). Porter served time for alleged embezzlement of funds from a poorly managed bank where he had worked (the charge was dubious, and he compounded it by fleeing the jurisdiction). While in prison, he began to publish stories under the pseudonym O Henry. After his release, he went to New York in 1902, writing 65 stories in 1904 and 50 in 1905. His best-known tales are probably "The Gift of the Magi" and "The Ransom of Red Chief." He died in 1910. There is a hotel named in his honor in Greensboro, the O Henry Museum in Austin, and the O Henry Memorial Prize for short story writing. The Disappearing Newspaper Book Review. Steve Wasserman, former editor of the Los Angeles Times Book Review, discusses the vanishing newspaper book review in the most recent issue of the Columbia Journalism Review. He writes, "Nearly a quarter century ago, according to a 1984 study in the Newspaper Research Journal, the average American newspaper used three-quarters of a page to one page a week for book reviews. . . . Readers know . . . in their bones something newspapers forget at their peril: that without books, indeed, without the news of such books—without literacy—the good society vanishes and barbarism triumphs." The noble librarians on the Fiction-L list have compiled a list of book titles and authors' names that their patrons have mangled. Take a look here. (Hat tip to Sarah Johnson). The bestselling Taylor Caldwell, author of Dear and Glorious Physician (about St. Luke), and family sagas such as The Captains and the Kings (later a miniseries starring the late Richard Jordan), Testimony of Two Men (later a miniseries starring David Birney and Steve Forrest), and numerous other novels, was born today in 1900. She died in 1985. Caldwell, who was born in England, served in the U.S. Naval Reserve during World War I as a "yeomanette." Her first editor was the legendary Max Perkins of Scribner; Scribner published her first novel, Dynasty of Death, in 1938 and nine novels after that. Some letters from Perkins to Caldwell are reproduced in Editor to Author: The Letters of Maxwell E. Perkins (ed. John Hall Wheelock, 1950). Caldwell's books are estimated to have sold more than 30 million copies. Caldwell, who struggled for many years to be published and was often criticized for overblown prose, once said her greatest inspiration was "the anticipation of big checks." More on her life can be found in her autobiography, On Growing Up Tough (1971). Expatriate African American writer Frank Yerby was born today in Georgia in 1916. He died in Madrid in 1991. Well known for his historical fiction, Yerby published The Foxes of Harrow in 1946, which sold more than 2 million copies in the 1940s and was adapted into a film with Rex Harrison and Maureen O'Hara. Much of his work draws on his Southern roots, such as Benton's Row (1954) and Captain Rebel (1956). The Voyage Unplanned (1974) deals with OSS and Resistance activities in World War II France. Yerby was also a fine short story writer, winning the O. Henry Memorial Prize in 1944 for "Health Card." Today's Washington Post looks at the wrap-up of David Simon's The Wire. For the article and some video, go here. Simon and I are both products of University of Maryland's College of Journalism, but we did not meet while on campus--he was a few years ahead of me and a distinguished editor of The Diamondback, and I worked on the campus radio station WMUC. Today's paper also features an article by a former WEBR colleague of mine, Heather Taylor, who now has her own show about baby boomers on WMET in Washington, DC. Heather is an inspiration to anyone who would like to make a career change in mid-life. I was distressed to learn of the Aug 18th death of Madeleine Stern, who, in conjunction with Leona Rostenberg, uncovered the pseudonyms and hidden thriller work of Louisa May Alcott. She was 95. After a Guggenheim fellowship, Stern wrote a biography of Alcott and edited several collections of Alcott's thrillers. With Rostenberg, she wrote vastly entertaining memoirs about their antiquarian book business, such as Old Books, Rare Friends and Old Books in the Old World: Reminiscences of Book Buying Abroad. Stern sent me a gracious letter when I published an article on Alcott's thriller work (giving her and Rostenberg full credit, of course); the article is reprinted in Deadly Women (Carroll & Graf, 1998). Memorial contributions may be made to Alcott's Orchard House.